I admit it – the cover pretty much hooked me. I enjoy weird and bizarre fiction and this certainly promised something out of the ordinary. It is 1945 in New Orleans and a massive hurricane has devastated the city and young teen Anaïs Reynard wakes up in an asylum with amnesia. The local doctor is trying to help her recover her memory because Anaïs was the only witness to the shooting of her stepfather – her only living guardian. A young stagehand whom Anaïs had befriended has been arrested and accused but she has her doubts, though can’t be sure why. One night Anaïs is visited at the asylum by a strange creature – a sharp-looking man with the head of a fox gives her a special key that unlocks a door that brings her into the land of Four Kings. Here all manner of men have human bodies and heads of various creatures: Raven, Lion, Snake, and even Unicorn. Anaïs navigates through the land of Four Kings, visiting each kingdom and showing her bravery and resolve. But she also skips back to 1945 earth with its own monsters – the Nazis. The puzzle of what happened the night her step-father was shot slowly reveals itself until she asks her attorney to put her on the stand to testify in the case against the young man she had once considered her friend. A book like this reminds us of how important a good editor can be to the process of getting a book published. There were many little moments along the way, all throughout, that held me back from really sitting back and taking in this book. From incorrect pronouns (“…the war that chased my mother and I out of Europe…”) to sections of the book that were simply moments of massive info-dump (“I’ll try to explain… well, human are …” and “Your blood, Anaïs, is a drug to us. …*long paragraph going into detail* …”). There were times (specifically the last third of the book) that I really got into the story and what was going on. But there were more times that I simply shook my head and wished for some tighter editing and a smoother sense of writing and character. I see the description (on Goodreads) and some of the reviews making comparisons to “Alice” and her trip down the rabbit hole, but I see this as The Chronicles of Narnia meets The Wizard of Oz that needs a little more attention. Looking for a good book? 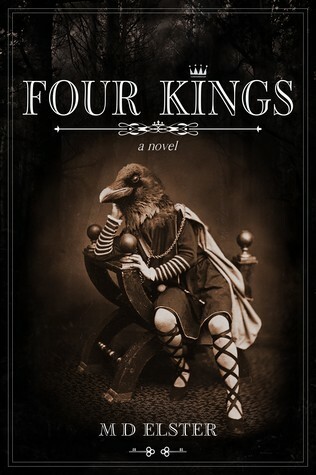 Four Kings by M. D. Elster is an inconsistent fantasy with moments that are captivating and moments that make the reader wish that the author had worked on the story just a little longer.